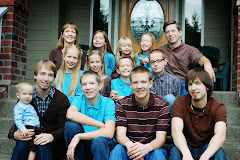 Way back in January I posted about our JBB -" Junior Bunk Bed" . Several of you have asked for the dimensions of the mattress and here I am, FINALLY, getting out a tape measure and posting the info for ya. The mattress' are: 30 inches wide, 60 inches long and 6 inches deep. We had them made from a high density foam and had a "ticking" over it (cloth cover, much like a regular mattress you can buy at the store). It pays to call around as the place we got ours from actually cost slightly less than some of the other places we called, but included the ticking and no where else even offered that as an option. This size easily accommodates Queen size sheets (fitted and flat) and blankets, quilts, etc. by cutting the Queen size item in half. The fitted sheets require a little finesse (I made square-ish corners from the raw edge, but you could put elastic into it if you want) but if you have a sewing machine and can sew a straight stitch you can do this. I found your blog via google, while trying to find Junior Sized bunk beds. 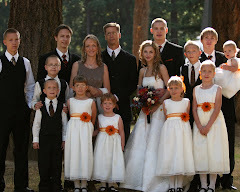 I am the mother of 7 children ages newborn to 9 years old. I am trying to find solutions to bedroom space issues. Did you all make your bunk bed or purchase it somewhere? 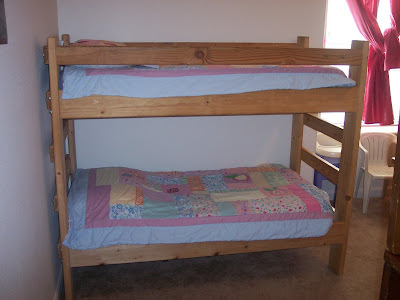 I really want to find a bunk bed that will fit crib mattresses but so far to no avail. If you have any information you are willing to share I would greatly appreciate it. God bless.